The thing is, we all know it's not really Christ's birthday, that he was born in April and that the early believers moved it up to blend with and ultimately dominate the Roman celebration of Saturnalia. And we all know that Hanukkah wouldn't be the giving-each-other-presents big deal holiday it sort of is � it's a relatively minor Jewish holy day, no? � if it weren't for American Jews wanting to have a fun kid celebration of their own to coincide with the surrounding in-your-face day of the dominant religious brigade. And we all know, don't we, that Santa and reindeer and north poles and fir trees decorated with twinkling lights, that none of them are truly related to the little Jewish boy allegedly born two thousand years ago in a stable. I am a secular Jew raised to celebrate the secular Christmas holiday. I enjoy it. I love the tree and the pretty lights. I love Damian's excitement and the excuse to get him things we want him to have. I love that it means people I love have a chunk of time off from work and we can gather together. I don't love the religious overtones. They make me feel downright squirmy. But I also don't love the religious overtones of Hanukkah, nor the celebration of a battle fought so long ago. I love Passover with its themes of freedom and self-rule. And in a way, I suppose, Hanukkah is similar. But I can't get all worked up over the desecration of a temple to a god I'm skeptical even exists. And I can't get all worked up over a baby who turned into a man who preached a lot of valuable lessons but whose words were later perverted to mean that some people are worth more than others. A lot of blood has been wasted and continues to be wasted in the name of various gods. So why celebrate if I don't believe? Because the celebration itself is worthwhile, is about community and twinkly lights and fables of red noses and chimneys and ideally, love. For a few years in my early 20's, I stopped celebrating. I found I missed it. Why should I take the fun away from my son and from me, myself, just because I don't believe in a separable part of the proceedings? So when someone wishes me a "Merry Christmas!" I wish them one right back. Because I hope it is. Merry. For all of us. Even those who choose to celebrate a winter holiday on a different day or days. We each celebrate in a different way, don't we? AMEN!!!!! Couldn't have stated it better myself (or, more likely, nearly as well). 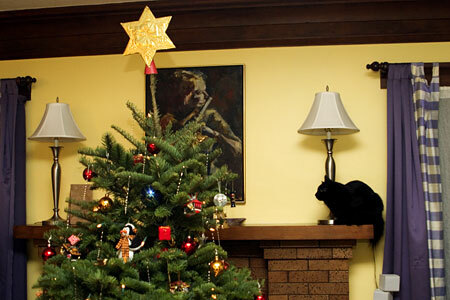 So glad to see someone else has a Christmas tree topped with a star of David! I have so many fond memories of tree-trimming parties during my childhood when my Jewish aunt, uncle, and cousins (my Dad's side of the family) would come over to help us decorate. No one seemed to have any objections to mixing the religions or to celebrating the secular aspects of the holiday. It was just a fun time to get together and put pretty shiny things on a tall tree. And I've always loved our orangey-pinkish plastic tree topper in the shape of a Jewish star, but I think your gold one is probably much nicer!